Kingston announces HyperX Fury, a new line of entry-level memory modules for gamers and overclocking enthusiasts. These sticks are available in 4GB and 8GB singles, or as 8GB or 16GB dual-channel kits. Frequencies range from 1333MHz to 1866MHz and latencies from CAS9 to CAS10. Each module runs at 1.5V and comes with a black, blue, red or white heatspreader. HyperX, a division of Kingston Technology Company, Inc., the independent world leader in memory products, today announced the launch of HyperX FURY memory for entry-level gamers and enthusiasts. HyperX FURY replaces the HyperX blu memory line. The new, next-generation high-performance memory offers automatic overclocking with an asymmetric, aggressive heatspreader design for the ultimate cost-efficient enthusiast computer experience. HyperX FURY memory is fully Plug and Play (PnP) so it automatically overclocks within the system speed allowance without any manual BIOS tuning. The new heatspreader design comes in four colors (blue, black, red, and white) and features black PCB to enable gamers, modders and system builders to have color matched systems. HyperX FURY is available in 1333MHz, 1600MHz, and 1866MHz frequencies. HyperX FURY system memory will soon be joined by HyperX FURY SSD, designed also for entry-level gamers and enthusiasts who want to get into the game quicker. HyperX FURY SSD allows PCs and applications to load faster and improve overall system responsiveness. 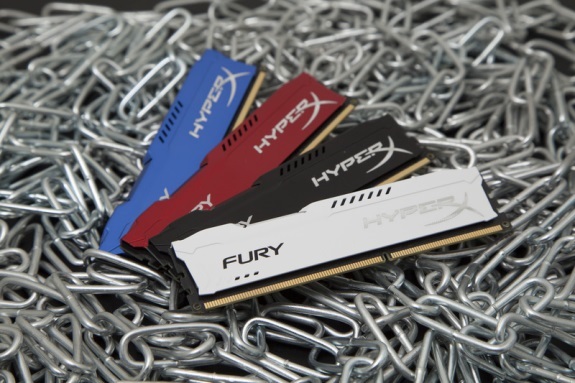 HyperX FURY memory is available in 4GB and 8GB modules as well as 8GB and 16GB kits of two. It is backed by a lifetime warranty, free live technical support, and legendary Kingston reliability.